Ratanapoon pagoda is situated on the hillock which is 10 feet high and 20 feet away from the northern part of Andawthein pagoda. The pagoda was built by king Min Kha Maung and his queen Shin Htwe in AD 1612. The pagoda was named as Ratanapoon because the treasures were heaped in the pagoda and in other words, the pagoda was called Ratanapoon in order to know that Rakhine people have taken refuge in three gems called Buddha, Dhamma and Samgha in strong faith. Ratanapoon was derived from Ratanapunya in Pali. The pagoda resembles Sanchi stupa in India and Kaungmudaw pagoda donated by king Thar Lun is Sagaing. Ratanapoon pagoda is enclosed with the wall. There are the entrance staircases in the east, the north and the south of the wall. There are lion figures which were made of stone at the entrances outside the inner wall. The pagoda is enclosed with seventeen brick pagodas. 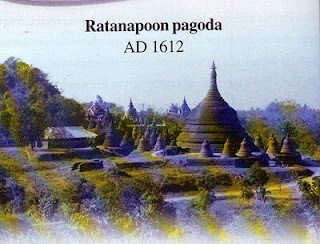 There are three stone pagodas adjacent to Ratanapoon pagoda in the east. The stone Buddha images are in the caves of those pagodas. Among those three pagodas, the enamelled slabs still can be seen in the cave of the middle pagoda until now. This pagoda is wrapped by the two big dragons with their tails, and roofed with their hoods over the pagoda. In the previous time, the prayer hall was built on the pagoda court in the east. The tiles are laid in order on the whole court of the pagoda. To flow the water out of the pagoda court, the elephant-head pipes were set up at the wall and those pipes can still be seen until now.